NFL's Wilfork Lifts Driver Out Of Crashed Car, Hours After AFC Title Game : The Two-Way Massachusetts State Police say New England defensive tackle Vince Wilfork stopped at an accident Sunday night and helped lift a woman out of a crashed car "with one hand." New England Patriots defensive tackle Vince Wilfork seen here before a practice Wednesday, helped a woman who was trapped in a crashed car Sunday night. 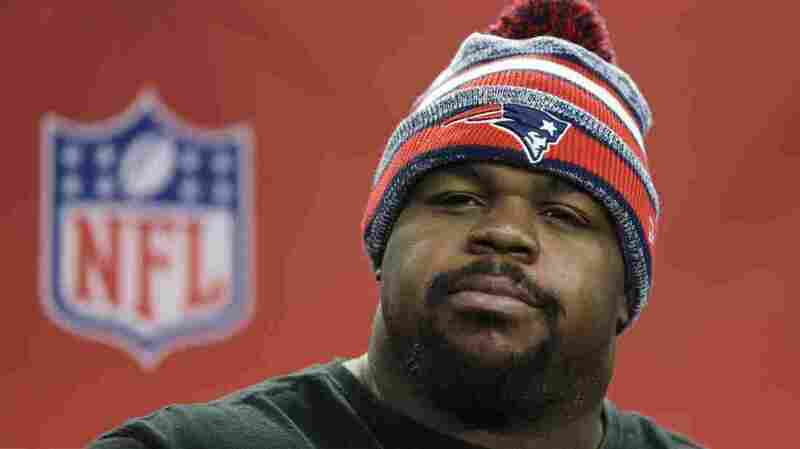 Massachusetts State Police are crediting New England Patriots defensive tackle Vince Wilfork with helping a driver at an accident Sunday night, after Wilfork helped lift a woman out of a crashed car — "with one hand," police say. The car had turned over on its side, trapping the driver. The incident occurred at 12:45 a.m., as Wilfork, whose NFL bio lists as being 6 feet 2 inches tall and 325 pounds, was heading home from the Patriots' win in the AFC Championship Game. That's when he saw a car had crashed on Route 1, which runs past his team's stadium in Foxborough. "Troopers arrived to find a 2015 Jeep Wrangler rolled onto its side. To their surprise, New England Patriots Defensive Tackle Vince Wilfork was beside the vehicle checking on the operator. "The operator of the vehicle, 38-year-old Mary Ellen Brooks of Hanson, was unable to get out of the vehicle. Trooper Kenneth Proulx stated that he held the driver's door of the vehicle open, and Vince Wilfork reached in and helped lift the operator out of the vehicle with one hand." Today, Wilfork didn't have much to say about his actions. "I saw somebody that needed help, and I helped," Wilfork told the Boston Herald's Karen Guregian when reporters visited the Super Bowl-bound Patriots' locker room Monday. The driver of the car received medical attention at the scene; she faces charges that she was operating a motor vehicle under the influence of alcohol.